One of the benefits of soaring is that you can begin at an early age and operate a glider independently, much younger than in an airplane. Learning to fly gliders also give you a strong basis in the fundamentals of flight before transitioning to powered aircraft. There is no minimum age to begin training. The minimum age to fly a glider solo is 14, unlike airplanes which have a minimum age of 16. Mohawk Soaring encourages the participation of youth in the club with discounted membership rates. The minimum age to get your glider license is 16, as opposed to 17 for airplanes. Learning to fly gliders is a great way to develop valuable life skills like problem solving, critical thinking and decision making. Students learn to work as a team as glider pilots rely on their ground crew. Many glider pilots are older so youth learn to interact with a wide range of pilots of different ages. Older pilots enjoy being able to pass their knowledge and love of flight along to the next generation of pilots. They also appreciate the youthful energy in doing some of the heavy lifting of retrieving gliders after landing and repositioning them for takeoff. Everybody wins! 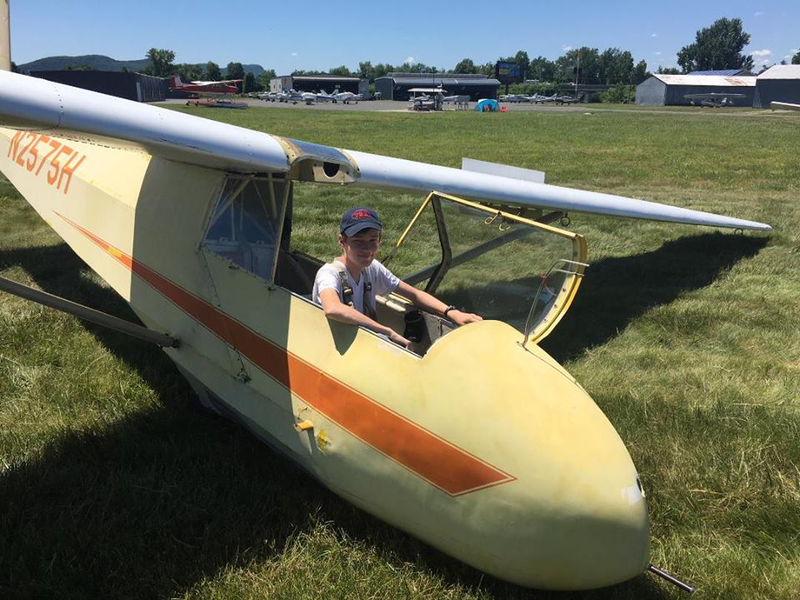 Learning to handle with responsibilities of flying a glider solo and guiding it in for a safe landing does wonders for a child’s confidence and self esteem. Nothing is more empowering than seeing them achieve something many adults only dream of doing. MSC Youth Member Alex Meyer, 15, after his first solo flight, his 14th glider flight.